The Queen voiced concerns to the previous government about the inability of UK authorities to arrest Abu Hamza al-Masri, it has emerged. The BBC's Frank Gardner says the Queen told him she had spoken to a home secretary about the issue. On Monday, a European Court of Human Rights ruling paved the way for the radical cleric to be extradited to the US after an eight-year battle. The Home Office said the extradition would happen "as quickly as possible". Speaking on BBC Radio 4's Today programme, our correspondent said the Queen had been upset that there was no way to arrest the radical cleric and spoke to the then home secretary to ask why somebody who appeared to be inciting violence and hatred was still at large. "Like anybody, she was upset that her country and its subjects were being denigrated by this man," said our correspondent, who stressed that the monarch was not lobbying but "merely voicing the views that many have". The legal and political importance of this final decision by the European court cannot be overestimated. In the wake of 9/11, Washington and London developed extradition and counter-terrorism strategies designed to make sure that suspects, wherever they were, would face justice. Now that Strasbourg has stepped aside, there is no other legal avenue open for three of the five. But there is a question mark over the fate of Babar Ahmad and his co-accused, Syed Talha Ahsan. Campaigners have raised serious questions about the fairness of what has happened to them. There has been an 11th-hour attempt to privately prosecute the pair because their alleged offences occurred in London. That may lead to a last attempt to delay their transfer - but many legal experts doubt that it could stop these extraditions, which are so important to both governments. A spokeswoman for Buckingham Palace said it would "never comment on private conversations involving any member of the Royal Family". The Home Office also said it would not comment on such conversations. It is rare for the Queen to express opinions on such matters. Labour MP Keith Vaz, chairman of the Commons Home Affairs Select Committee, said it showed "how deeply concerned" the Queen is for the "welfare of her subjects". He told BBC News: "It's good that she has mentioned this to the home secretary and absolutely appropriate." But campaign group Republic has accused the BBC of revealing details of the Queen's interest in the case to put her "on the right side of public opinion". "The decision to disclose this one conversation while keeping all else secret smacks of a deliberate PR stunt to put the Queen on the right side of public opinion," the group said. On Monday, a panel of the European court's highest judges declined to refer the case of Abu Hamza and four other terrorism suspects to the European Court's Grand Chamber - the last avenue of appeal open to them in their fight against extradition to the US. The men have argued that they will face inhumane treatment in the US if they are sent there. But the US authorities, supported by British officials, are now working on arrangements to transfer the men to America to face terrorism charges. It is believed extraditions could happen within three weeks. Abu Hamza is wanted over allegations he plotted to set up a terrorist training camp in the US and was involved in kidnapping Western hostages in Yemen. If convicted, he faces life imprisonment. Abu Hamza has argued he would face inhumane and degrading treatment if imprisoned for life without possibility of parole. His legal battle has lasted more than eight years and cost millions of pounds. The case of Babar Ahmad - who, with co-accused Syed Talha Ahsan, is alleged to have run a jihadist website in London that provided support to terrorists - is not as clear cut, according to BBC home affairs correspondent Danny Shaw. Media captionFahad Ansari: "The fight will never be over until Babar (Ahmad) is back home with his family"
Campaigners for Mr Ahmad say the battle to keep him in the UK will continue. His supporters say he should stand trial in the UK because the alleged offences occurred here. Earlier this month, a businessman began the process of launching a private prosecution, saying that British suspects should be tried in the UK, not abroad. 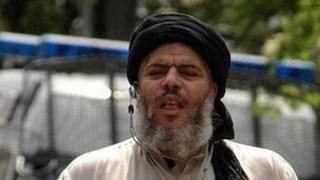 Adel Abdul Bary and Khaled al-Fawwaz are accused of being aides to former al-Qaeda leader Osama Bin Laden in London. They said that they faced an inhumane regime of solitary confinement in a special "supermax" prison. The five men were indicted on terrorism charges by the US between 1999 and 2006. Abu Hamza and Mr Ahmad have been in custody since 2004, and Mr Ahsan since 2006; the arrests of Mr Bary and Mr al-Fawwaz date back to 1998, making them the longest-held detainees without trial in the UK. Abu Hamza was convicted in 2006 in the UK of charges including soliciting to murder and stirring up racial hatred, and given a seven-year jail sentence. Following the European ruling on Monday, US Justice Department spokesman Dean Boyd said: "We are pleased that the litigation before the European Court of Human Rights in these cases has come to an end, and we will be working with the UK authorities on the arrangements to bring these subjects to the United States for prosecution." Abu Hamza: What happens next?